In the last few months we have received a number of mails inquiring into whether we (the people behind this blog) have any particular political, religious or philosophical beliefs. 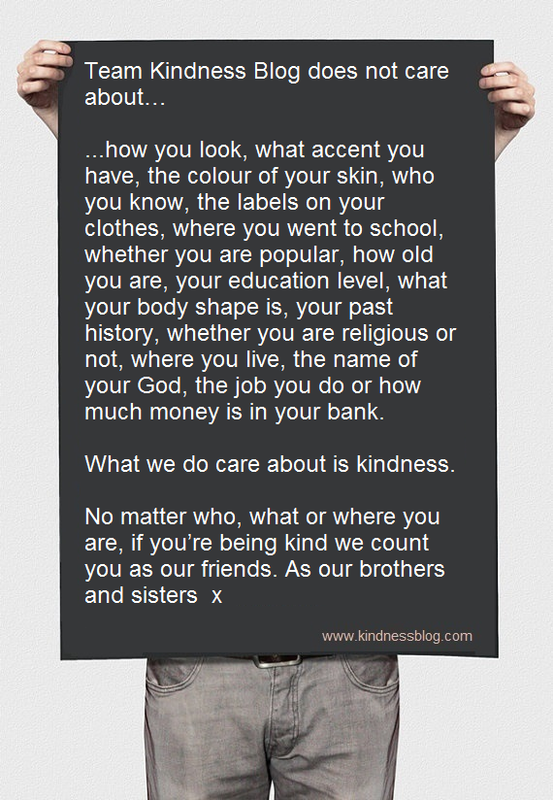 Well guess what you amazingly gorgeous creator’s of the kindness blog!? It is because of those word’s above and your heartfelt intention to bring the essence of kindness to this planet everyday that I do believe…that ‘I’ have become a better person…this blog remind’s me to start with ‘The man (or in my case woman) in the mirror’ everyday…it’s actually become addictive!…asking myself the question as my feet hit the floor each morning…’Now…how can I show kindness today?’ so anyhoo….Thank you! I LOVE this blog and its message! I hope that you appreciate it too.